As one of the most diverse cultural hubs in the US, Miami has given the world so much. We have phenomenal restaurants you can only find in gas stations, some of the best rooftop bars in the nation, and a large variety of the most irrationally passionate people in the world. 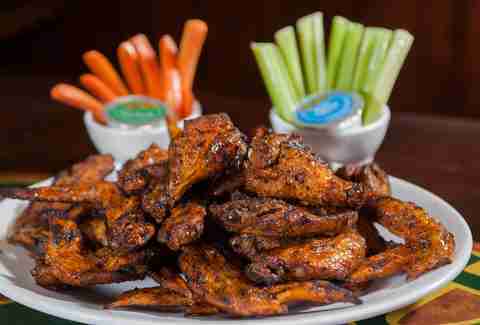 So, it should come as no surprise we treat our wings with a range of diverse cooking methods and irrational passion. 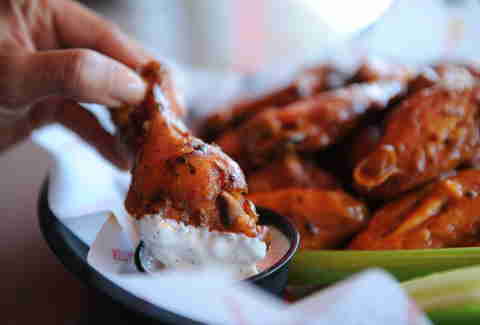 Here, in no particular order, we present you with Miami's best wings. The only question left is: blue cheese or ranch? Though scarfing down wings at Sports Grill for an entire Sunday is as much of a Miami initiation as getting towed, the best way to have these fried-then-grilled beauties is with the signature Dale sauce. Surprisingly pronounced “DAY-uhl” and not “Dah-LAY,” this sauce named after a longtime regular is a spicy, smoky mix that’s unmatched anywhere in the city. The Bucket o' Wings, tossed in a creamy Vietnamese Sriracha and Thai chili sauce, are possibly the strongest things to hit the corner of San Amaro and Ponce De Leon since Ryan Braun was playing at Alex Rodriguez Stadium. If you're looking for a list of the best places to eat in Kendall, take a stop right here. If you're looking for a very specific spot in Kendall that serves up grilled wings soaked in BBQ sauce near the Urban Development Boundary, Keg South of Kendall is your best bet. You want smoky wings that fall off the bone? Go elsewhere. You want a tangy Buffalo-style number? Not your spot. You want a delicious wing that's also so hot they dare you to eat eight in eight minutes, despite the fact you'll wanna spray yourself with a fire hose after eating just one? Pizza Bar’s Kiss of Deaths are your No. 1 pick. 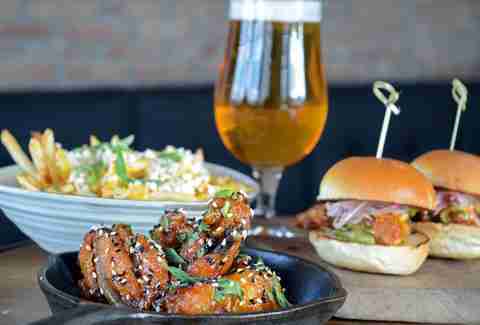 This Gables happy hour mainstay combines its collection of 42 beers exquisitely with their sweet and spicy wings. They come in tasting like candy, but throw a nice kick right at the end. Genius -- since the sweetness complements a nice lager perfectly, and the spice makes you want to drink more. You might think serving peanut butter & jelly wings falls into the same category as chili-garlic ice cream as "things you love separately but would never want together". But these wings taste more like Thai peanut wings dipped in sweet-and-sour sauce than your favorite fourth-grade lunch mixed with poultry. In perhaps the most creative all-around food-drink spot in Miami, it should be no surprise the wings here take the traditional bar app and make them into something totally unique. The brown sugar sesame wings are a caramely soy concoction covered in sesame, giving them an Asian flavor mixed with a little bit of fall seasonality. Though having a small chain of restaurants named “Hole in the Wall” might seem like a little bit of a misnomer, the wings here taste way more like a dingy local haunt than a multi-location outlet. They’ll combine any flavors you like, toss the wings in ‘em, then throw them on the grill to caramelize the flavors. Try the hot, honey, and barbecue for something you’ve never had before. If only this place had been around when the old Miami Arena was there, we all could've saved a ton of cash on terrible concession food. This Overtown spot has over 50 different sauces, including Hennessy Glaze, Cinnamon Love, and Barack Obama. But if you're looking for the crowd pleaser, don't sleep on the lemon pepper wings. There are people out there who do crazy things like go to a seafood restaurant with zero intention of ordering seafood. For those culinary oddities, no place in Miami beats Captain Jim’s, where these only-on-the-weekend Insane Baked Wings are marinated for three days in a tomato jalapeño puree, then grilled. They usually sell out by Sunday afternoon, so if you want to try them, Friday or Saturday night is the time. You know who doesn’t get enough credit? Anthony’s. 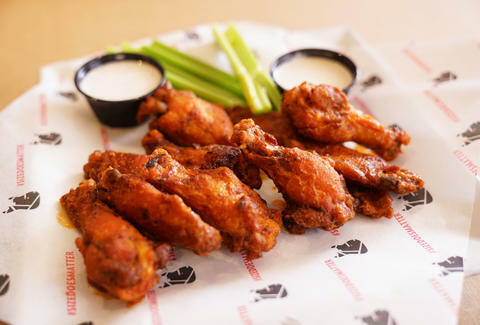 Not only do they cook up some of the best pizza in South Florida, their wings are a staple at tailgates, golf tournaments, office parties, and Wednesdays when you don’t feel like cooking. And nobody complains. These garlicky, salty, char-grilled, coal oven-roasted gems are a juicy combination of smoky and savory. And just because they come from multiple locations doesn’t mean they’re any less delicious. Matt Meltzer is a contributing writer for Thrillist who still prefers chicken tenders. Follow him on Instagram @meltrez1.